From Mark Fidrych to Victor Cruz, sports has seen Lin-esque ascents in the past. 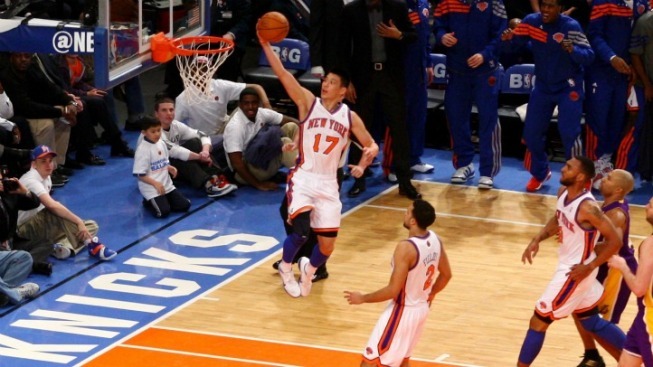 Jeremy Lin's magnificent arrival on the American sports and pop culture radar reached three more milestones on Monday. He's going to be on the cover of this week's Sports Illustrated, he was named the Eastern Conference Player of the Week and he was the target of a pretty nasty swipe from another member of the sports firmament. Boxing champ Floyd Mayweather said that Lin's rapid embrace by the world is because he's Asian and that black players do what he does every week without getting the same kind of hype. Mayweather's wrong on several points, most notably that no one of any skin color in the history of basketball has done in their first four starts what Lin pulled off for the Knicks last week. He'd also be wise to recall the way Tiger Woods, the Williams sisters and others have been received upon their smashing debuts on the scene. The key here isn't just what Lin has done on the court but the way that he has confounded expectations while doing it. Part of that is because he's Asian-American, but most of it is because of the fact that he came from essentially nowhere to do it. Mayweather, and those who say that this is just a case of New York dominating the media as well, should remember that there have been others who have burst out of obscurity to capture the hearts and minds of the masses. And, as you'll see in the list that follows, most of those that have done it haven't quite done it at the same level that Lin achieved in his first week. Tim Tebow: Another popular one over the last week, including on these pages, but it simply doesn't hold up to scrutiny. Tebow won a Heisman Trophy and two National Championships at Florida, and he didn't play anywhere near Lin's level outside of some fine fourth quarter comebacks. Billy Ray Bates: This isn't a name on the tip of the tongue of anyone who hasn't read David Halberstam's The Breaks of the Game -- a group that should include anyone who cares about basketball in the least -- but anyone who has read it probably thought of him last week. Bates signed a 10-day contract with the Blazers in 1980 and immediately put on a show as a point scorer that included 40 points in 32 minutes of one game. Bates flamed out as quickly as he arrived on the scene thanks to drugs, something that seems unlikely with Lin and the generally shabby nature of the NBA in those days kept him from achieving overwhelming stardom. There's little doubt that he'd be on Sportscenter constantly if he pulled the trick off in the current age. Fernando Valenzuela: Fernandomania was to 1981 what Linsanity is to 2012, a clear sign that it isn't just our instant availability culture that pushes sports phenomenons. The big difference here is that people saw Valenzuela coming thanks to his 17.2 shutout innings of relief work down the stretch in 1980. Victor Cruz: Cruz was also undrafted and also achieved at a level far beyond what anyone expected of him this season, but there's a pretty big difference. Lin is a point guard charged with running the entire offense while Cruz's skills would mean very little without Eli Manning delivering him passes. Boris Becker: When Becker won a pre-Wimbledon tournament in 1985 it didn't do much to make people take notice of him as a championship contender. He remained unseeded on the grass courts, but made a run to the title at just 17 all the same to make him a serious bolt out of left field. Kurt Warner: Tebow has been talked about a lot, but Warner's story is actually a lot closer to Lin's. Forced into action by injury, Warner, undrafted and a veteran of minor leagues like Lin, had to play well or a talented Rams team would have been a bitter disappointment in 1999. He played well enough to wind up as the league's MVP and the Rams won the Super Bowl. That's getting way ahead of ourselves, but Warner comes closer to mirroring the role Lin is playing for the Knicks this season than Tebow did for the Broncos. Mark Fidrych: "The Bird" didn't last long, but his arrival on the scene felt a lot like Lin's. He pitched just twice in relief in the first 23 games of the Tigers' 1976 season and then finally got a chance to start when the Tigers ran out of other options. Fidrych won nine of his first 10 starts, going the distance nine times and landing on magazine covers and national television as a result. He was a phenomenon, thanks in part for his habit of talking to the ball and even more because no one saw him coming a mile away because he didn't seem to have the dominant skills normally associated with a big-time winning pitcher. Injuries meant Fidrych lasted just a short moment in time, but his arrival on the scene leaves him as the closest to Lin on this list of sports supernovas. None feels like an exact fit, mostly because Lin has done something no one else has ever done before in his first four starts, but the idea that this hype is being conjured up out of thin air and not performance is pretty demonstrably false given how much ink was spilled on all the other guys who share his ability to make an auspicious debut.